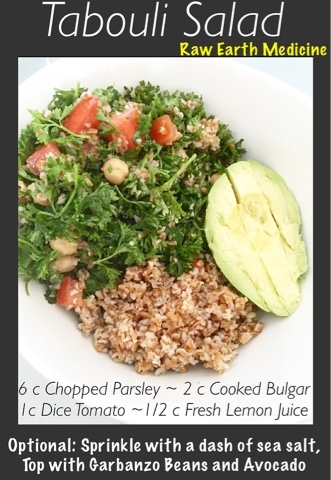 This tabouli salad is not only delicious it's also very nutritious! 1. Parsley: Parsley is rich in many vital vitamins, including Vitamin C, B 12, K and A. This means parsley keeps your immune system strong, tones your bones and heals the nervous system, too. It helps flush out excess fluid from the body, thus supporting kidney function. Regular use of parsley can help control your blood pressure. 2. Tomatoes: Tomatoes are also an excellent source vitamin C, biotin, molybdenum, and vitamin K. They are also a very good source of copper, potassium, manganese, dietary fiber, vitamin A (in the form of beta-carotene), vitamin B6, folate, niacin, vitamin E, and phosphorus. They help boost your immune system and can contribute to defending your body against free radicals that lead to common illnesses like the flu and colds. 3. Bulgur: Bulgur is low in fat, high in minerals like manganese, magnesium and iron, plus it's a good source of plant-based protein. It also provides a the dietary fiber you need for digestive and heart health! 25% of your daily needs in every one-cup serving! 4. Lemon Juice: High in vitiman C, lemons are wonderfully detoxing while providing the body with immune boosting nutrients. This salad is made with fresh whole foods that are chemical free non GMO and amazing for your health. It's also ridiculously delicious! Everyone is political about people not actual issues. There isn't a single political post on my feed that isn't just a hate poster about literally nothing. I don't care who wrote who's speech. Here's what I care about, the fact that our country is being poisoned by our food which is giving everyone cancer, heart diseases, diabetes and making everyone obese. 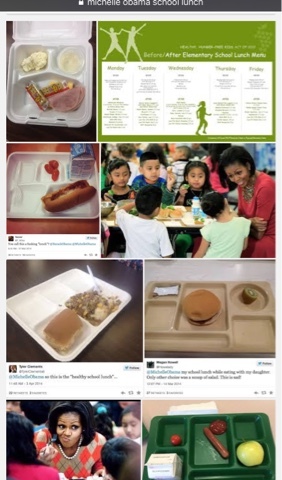 This is a picture of the school lunches under Michelle Obama's guidance. Hillary Clinton is part of the people who are allowing Monsanto and other Biochemical companies to literally poison you, while keeping you in the dark. She's pushing the dark ban which means your food won't be labeled with what poisonous chemicals are in it. How can your health or the health of your children mean more to you than who wrote a republicans or democrats First Lady speech, when your current First Lady thinks your child should eat processed fake meats with hormone filled milk. There isn't a single issue besides health and environment that should matter more because without those two things, we are all dead. So, continue hating each other over things that don't matter without having a single issue that's actually important to discuss. This is really where all lives matter. 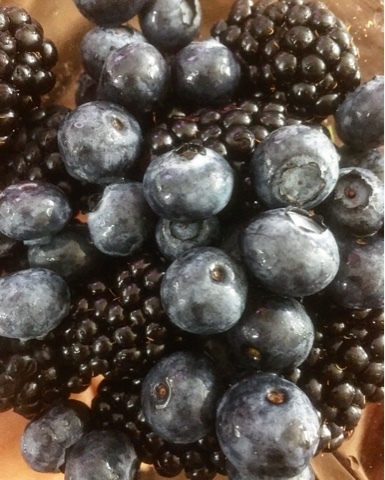 Blackberries and Blueberries have the highest levels of antioxidants. Do you know how antioxidant rich foods are rated? ORAC values are a measure of the antioxidant activity. It measures the degree and length of time it takes to inhibit the action of an oxidizing agent. Antioxidants inhibit oxidation which is known to have a damaging effect on tissues. Studies now suggest that consuming fruits and vegetables with a high ORAC value may slow down the aging process in both the body and brain. Single servings of fresh fruits and vegetables supply an average of 600-800 ORAC units. Scientists believe that increasing intake of foods that provide 2000-5000 units per day may be needed to increase serum and tissue antioxidant activity sufficiently to improve health outcomes. Cancer and Heart Disease are oxidative diseases so increasing your intake to the recommended units will help prevent these diseases. Use either a teaspoon of olive oil or Spectrum Expeller Coconut Oil Cooking Spray to grease pot. 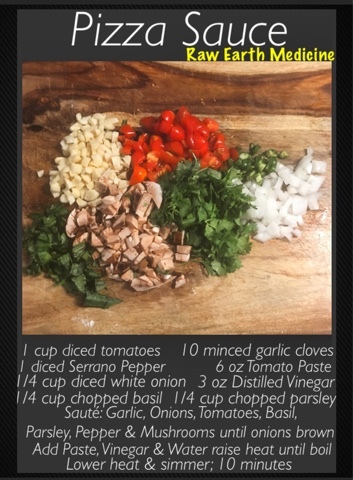 Sauté: Garlic, Onion, Serrano Peoper, Mushrooms, Tomatoes, Basil and Parsley until the onions start to brown. Add tomato paste, distilled vinegar and water. Raise head and stir until it starts to bubble/boil then lower the head to a simmer. You can leave the sauce thick or you can add water to thin it out. The longer it simmers the more the blended the ingredients get. If you want to spice it up add the dried ingredients while the sauce simmers! I like a chunkier sauce so I keep it as is but you can add more water and simmer for longer for a thinner sauce! Fresh, natural and delicious homemade sauce in less than 10 minutes. Yum! Step 2: Combine 3 cups flour with sea salt in a large mixing bowl. Make a well in the center and pour in your yeast mixture and coconut oil. Using a spoon, stir flour into well, blending well to get rid of any lumps. Next, place dough onto a lightly floured surface. Dust your hands with flour and knead gently. Turn and repeat until the dough is silky and elastic (less than 5 minutes) Add a little Coconut oil to your hands if the dough is too dry. Tip: if you knead too much it overdevelops the gluten in the flour and results in a tough crust. Step 3: Form dough into a ball and lightly coat with coconut oil. (Less than a teaspoon) Place dough back in mixing bowl. Cover the bowl with plastic wrap and drape a kitchen cloth over top. Let the dough rise in a place warm place (68 to 72 degrees) until it has doubled in size (about 1 to 2 hours). When the dough is ready, punch it down using your fist, to eliminate the air bubbles. Divide dough into 4 to 6 equal portions. Dough can be kept refrigerated for up to 36 hours or sealed and froze for up to a month. Tip: Let chilled dough come to room temperature before shaping. Baking: Pre-heat oven to 500 degrees for 30 minutes prior to baking. Pizzas should take between 10-15 minutes to bake depending on thickness of the pizzas. Tip: lightly oil or spray dough with Spectrum Coconut oil cooking spray before baking to prevent burning the dough. Ingredients tip: The Unbleached organic flour can be replaced with any other type of flour that you want to use (quinoa flour, brown rice flour, chickpea flour) to accommodate your dietary needs. This recipe is a versatile vegan base recipe. You can add spices to the dough and make a Rosemary and Garlic crust. 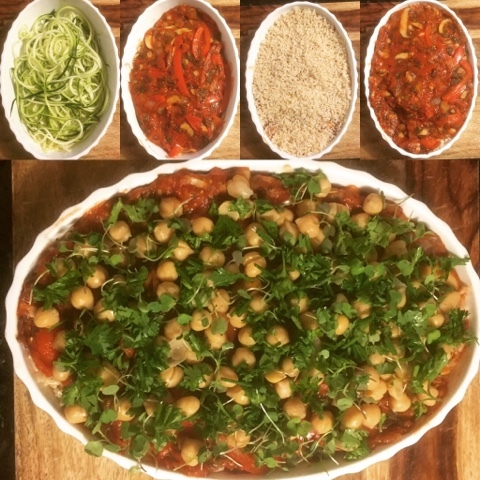 Use this base recipe to be creative and please your own taste buds while being as healthy as possible! 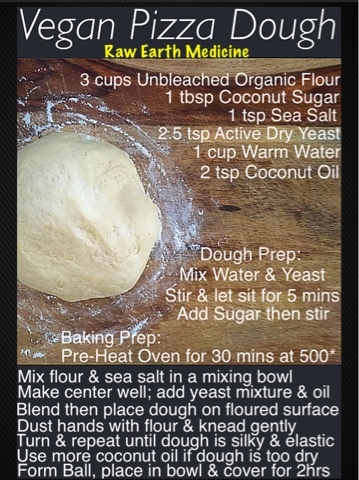 You can make any type of vegan-pizza, flat breads and even bread bowls with this basic dough. If you entertain, have a big family to feed or meal plan, you can double the recipe and have the dough on hand! I've asked my brother and mother to get therapy with me to develop a new foundation for healthy relationships to break the dysfunctional cycles of our family. I was told I have isolated myself from them and my mothers cancer was used to try to make me go against what is the right thing to do which is therapy. 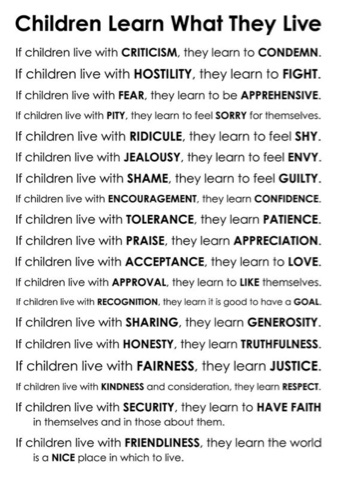 Parents raise children, children don't raise parents, so when a child develops disorders it directly corilates to the family dynamic. I was tormented by my brothers, my mother and my grandmother over my appearance and if I tried to complain about it my mother would say, I don't want to hear about it. To this day she denies this, probably because she didn't want to hear it. She was very critical of everything, had zero tolerance for emotions and any compliment you were given came with a backhanded criticism. My aunt was very jealous and would say awful things to me and my parents would never defend me, they would just say she is mentally ill.
My parents felt that if you throw money at problems they go away. 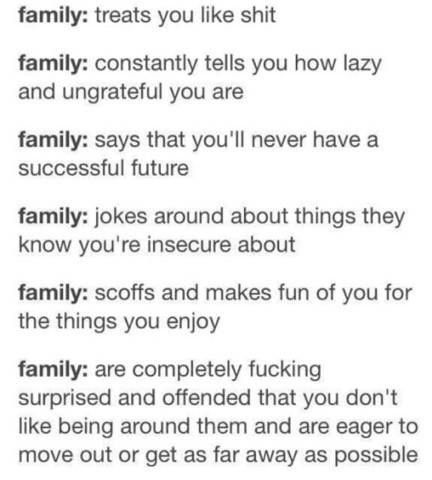 My family all talks negatively about each other behind each other's backs then are phony to your face. I developed an eating disorder and body image dysmorphia which lead to me using crystal meth at 14 years old. I just thought that if I could be skinny the criticism and talking about me behind my back would stop. 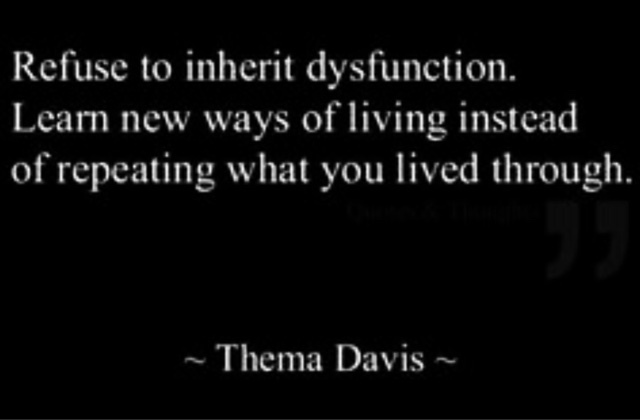 I've been through counceling my whole life trying to change what my family thinks is wrong with me while none of them get actual mental help, they all just get medicated for their mental illnesses and carry on with their abuse behavior. 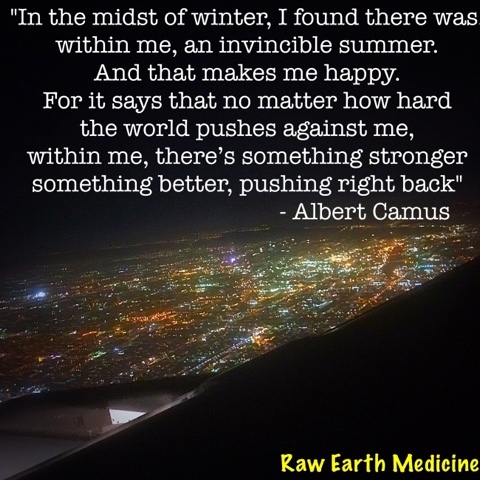 I have overcome the affects of my families dysfunction by therapy, doing hard mental work, developing the right tools, knowing my triggers and I have tried to accommodate their mental illness for a very long time until now when it's affecting me again and I can no longer accommodate them because of the physical pain I deal with from an accident. I have asked for years for us as a family to get help but the only person who has is me. 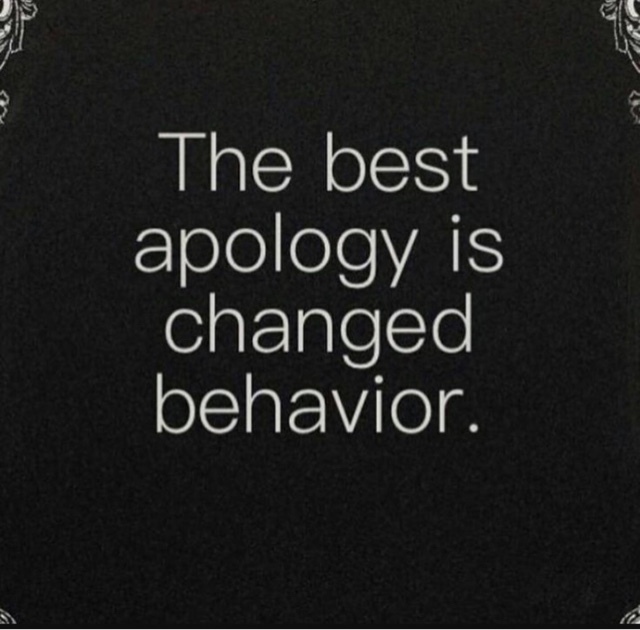 So, what happens when you evolve, change, develop healthy communication, talk about your feelings and overcome all odds but the people who caused you to develop disorders in the first place do nothing? You get to a point where they are all the same as they were 30 years ago telling you, that you are the problem. You see, I am happy in my life, have wonderful relationships, a passion for living, proud of my accomplishments and am happy with myself as a person despite living in constant pain and struggling to be able to walk from a major trauma. I am even happier without being involved with these people but they want me back in their dysfunction to just sit there and take it without any of them actually doing any mental health work to make me want to be there. 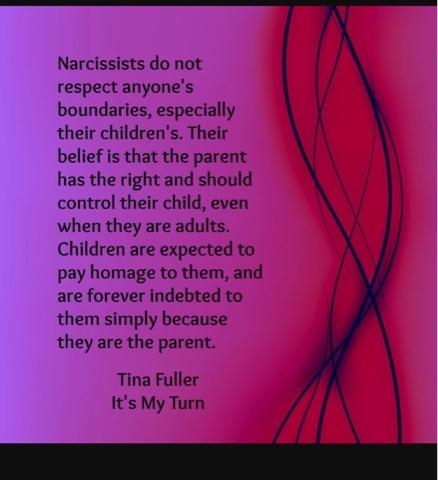 Life is hard enough as it is and if your family puts you down or isn't nice to you, discredits your intelligence and wants you to be anyone but who you are, they aren't your family, they are your abusers and it's time to end that cycle. They either get help and you work together with a professional in a safe environment to create change or you move on with your life and create a family for yourself that lifts you up, supports your passions and prioritizes your relationship to work together on keeping it healthy. Reality and functionality is a wonderful place to live, I do hope that one day my family would join me here but my bets are on them continuing to think I'm the problem. 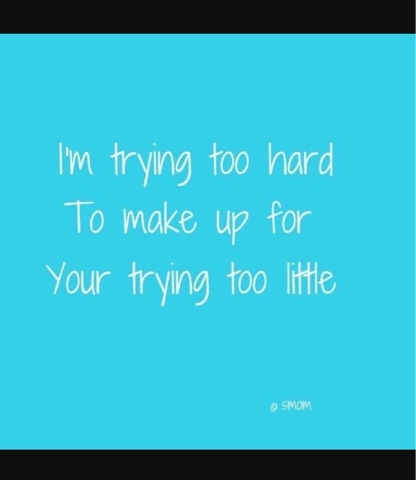 Problem solved, I've moved on with a glimmer of hope still in my heart. 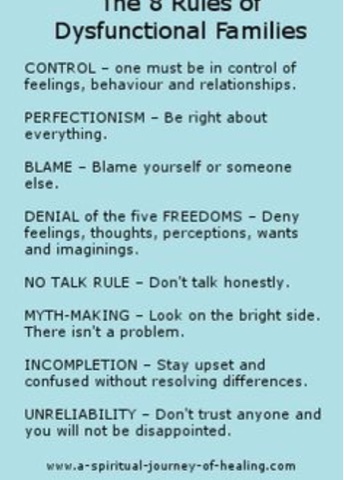 My door is always open but the boundaries are set and they don't bend for dysfunction they are there to keep it out. 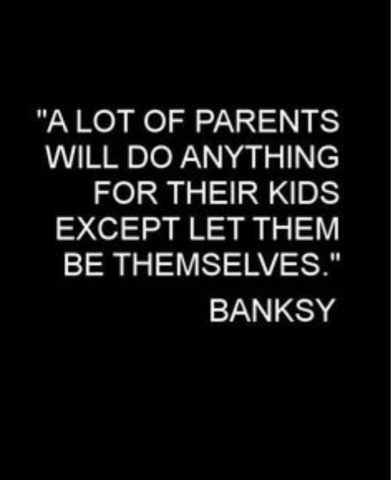 .... And they lived happily ever after but first it starts with YOU! If we can all develop our sense of self and stand strong as individuals we will break the divide between us. At our core we are all the same, we are all human. Thats our common ground. 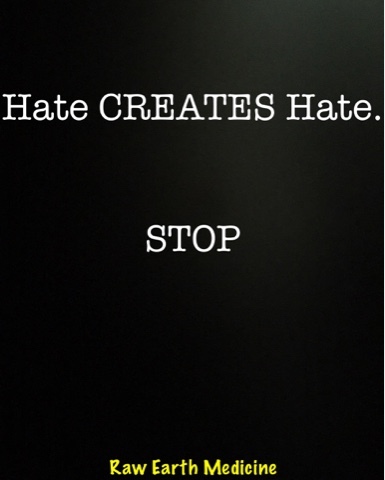 If each individual human did their part to stop creating hate and spreading it, we would see change. We create divide when we segregate ourselves and define ourselves by a group. When I meet a new person I don't really notice their race, clothes or anything other than what they say and what they are like and stand for as a human being. Each person is different and when you can only see their race, their status or anything else that holds no value really, then you are perpetuating the problems we have created. The movement shouldn't be black lives matter or gay pride or white pride, it should be we are all human, we are all individuals, we are all different, we are all the same. When something tragic happens we break out in protest and blame, creating even more hate, violence and tragedy than the original happenings. It defeats the purpose. The response should create love, good and give kindness back to the community to recover from the hateful act and deliver that message. Our love is above spreading hate about who did this. Your hate doesn't cancel out our love and kindness or bring us down to your level of behavior. Our need as people to be a part of something because we are so needy for acceptance while being so judgmental of others at the same time, is the root of the problem. We need to be part of the group, we need a partner, we need acceptance; when all we really need is the self love, confidence and knowledge that we are good enough as individuals to stand on our own to stand up for ourselves and be the good we want to see in the world. Keeping up with "The Jones" as they say, is really keeping up the divide, creating the hate and elevating the tragic epidemic of senseless violence. People want something to hate to make themselves feel better or feel a part of something but what they really need, is to be loved as an individual. 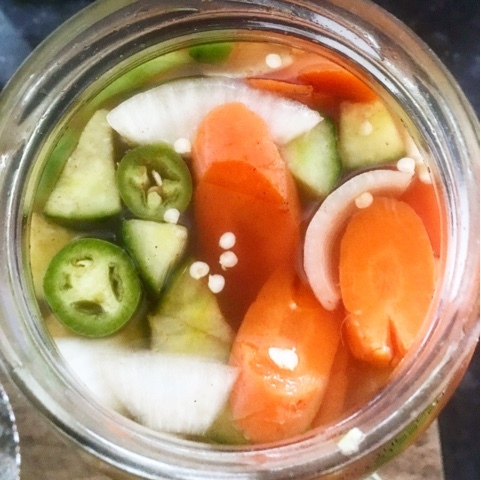 When you create the perfect pickling recipe for the win! Seal Jar tight! Shake and Roll the Jar until everything has intermingled. Place in refrigerator for 12hrs minimum. This is a healthy spicy & sweet snack you can always have on hand! Yum! Place in oven for 5-7 minutes or eat as is! I can't even with this deliciousness! 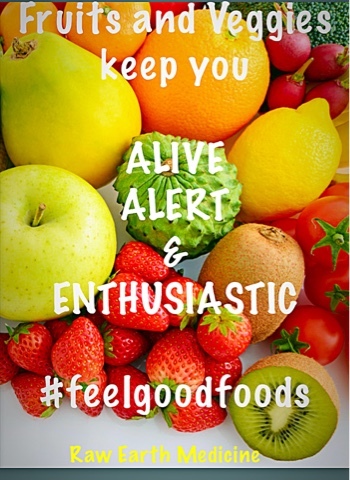 Fruits and Veggies keep you alive, alert and enthusiastic! By definition: Nutrition is the science that interprets the interaction of nutrients and other substances in food in relation to maintenance, growth, reproduction, health and disease of an organism. Humans are Multicellular Organisms who consume a diet to get their nutrition. The original definition of diet: the kinds of foods a person, animal or community habitually eats that are indigenous to their geographical location. Your diet needs to be full of positive, living, natural foods in order to maintain health, mentally and physically grow, be capable of reproduction, have good health and prevent disease! Is what you are eating capable of doing that for you? Did you know Protein doesn't keep you alive, alert and enthusiastic. Over consumption of protein keeps you thin not healthy and it actually contributes to disease. Fruits and Veggies are the part of your nutrition that do that for you. Look it up! Be educated about the truth. Protein is a small fraction of your nutrition while all other nutrients found in fruits and veggies are more crucial to you maintaining health and preventing disease.